Journalists gather in Regina to discuss current efforts to decolonize media. When eleven Indigenous journalists and authors took the stage in Regina Nov. 5, it was a collective “wow” moment for the audience—and for the panelists themselves. With veteran CTV assignment editor Nelson Bird, who hails from Peepeekisis First Nation, standing alongside relative newcomer Chris Tyrone Ross, the man behind RezX TV and RezX Magazine, it was clear Indigenous journalists have become a rising force on the Prairies, and that a process of change is well underway. The Decolonizing Media event was hosted by the University of Regina School of Journalism and the U of R Community Research Unit at the Royal Saskatchewan Museum Theatre, in conjunction with Media Democracy Days. “We’re actually talking from a position of strength. The majority of the world’s people have been colonized,” noted panelist Doug Cuthand, whose columns appear in newspapers across the country. “This is the time of truth and reconciliation, and we all have to take that personally. I see my role as someone who asks the questions that need to be asked,” said Betty Ann Adam, whose Star-Phoenix investigations helped launch a public inquiry into the freezing death of teenager Neil Stonechild, witnessed in police custody the night of his death. . .
“You see people come into the newsroom who really don’t know how the other half lives,” agreed Adam. She cited the example of a young reporter who took a landlord’s version at face value in a landlord-tenant disagreement, without understanding how the Indian Act affects housing and tenancy issues. Adam said the reporter wasn’t deliberately unbalanced—he just lacked crucial information to ask the right questions. Adam provided some background context to the reporter, something she sees as one of her informal newsroom roles. “I try to look at the stories my colleagues do, and check in with them,” she said. Several of the panelists spoke about myths held by non-Indigenous journalists, some bizarre (an Ontario transplant who was surprised to learn Indigenous people use cutlery), others commonplace (not understanding how the Indian Act affects daily life). Carmen Robertson, co-author of Seeing Red: A History of Natives in Canadian Newspapers, pointed out examples of how Indigenous people are misrepresented in the media and popular culture. Creeson Agecoutay–new host of CTV’s Indigenous Circle and recently voted Regina’s favourite journalist by Prairie Dog magazine readers–recalled colleagues constantly using the phrase “let’s get together for a pow-wow” when they wanted to meet. “I would never say, ‘Let’s all get together for a bar mitzvah,’” joked Agecoutay. When he explained to his workmates the role of pow-wow in First Nations society, they stopped using the phrase. Others agreed that it was helpful to address workplace attitudes up front. “I felt like the token Indian,” said new graduate Jeanelle Mandes, after her first assignment editor slotted her in the Indigenous beat without first asking if she was interested in other things. Although a rookie, she decided to tell her editor she would like more variety..
“I was glad I spoke up,” said Mandes, who now works for U of R Press and freelances for Eagle Feather News. Change is slow on the outside, too. Ntawnis Piapot, a broadcast journalist who has worked for APTN and CBC, said racism is palpable on the front lines of daily news coverage. “People in power will talk down to you. You definitely feel the racism,” she said, describing situations where interviewees asked when the “real reporter” was showing up. “When you confront racism, you’re looked at as ‘that mad Indigenous woman,’” said Piapot. In the workplace, though, “CBC believed in me,” she said. The public can be another matter. Responding to an audience question, Leader-Post reporter Kerry Benjoe said online comments discourage Indigenous people from appearing in the media. “It’s upsetting when people say, ‘I don’t want to be in the paper because people will laugh at me,’” she said. Several of the panelists said they avoided reading comments on their stories, which are at best loosely moderated for hateful content. There was a sense among the panelists and participating audience members that progress is inevitable, accelerated by the emergence of independent media outlets like former radio journalist Mervin Brass’s newly launched Treaty 4 News. Indeed, in conversation before the panel, moderator Shauneen Pete said the appetite for Indigenous media surprised her at the premier of The Four, an Access 7 talk show she co-founded. While she assumed family and friends would show up, she didn’t expect some 180 members of the public to pour through the doors to see four Indigenous women talk about current events. 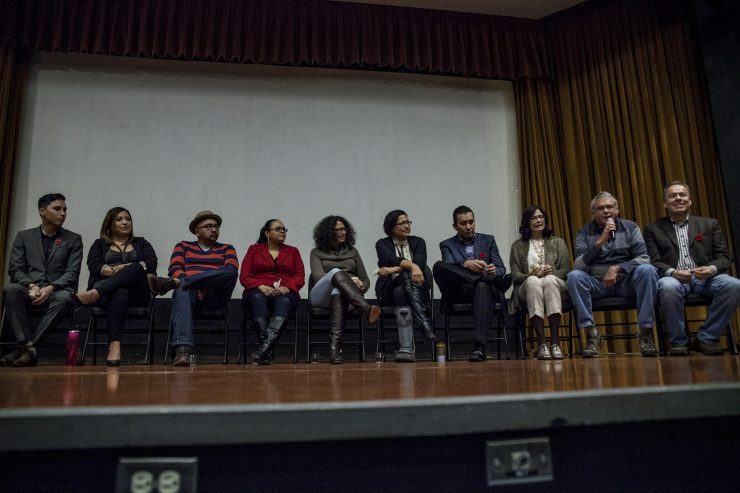 Following the Decolonizing Media evening, Pete noted the role the Indian Communication Arts Program (INCA) at First Nations University of Canada, under the direction of Shannon Avison, played in incubating many of journalists on stage. Several of the panelists also held U of R bachelor’s degrees in journalism. In addition to being an active media producer, Pete is a U of R professor of Aboriginal education and executive lead on Indigenization. “As we re-make universities through processes of decolonization and Indigenization, we can't forget that to not do so means we contribute to the continuation of ignorance in our communities,” she said.